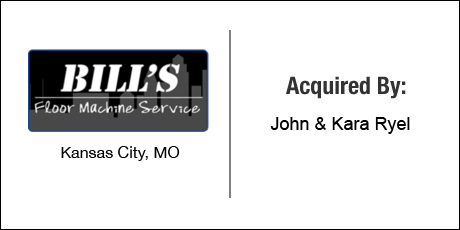 The Seller: Bill’s Floor Machine Service has been selling new and used floor cleaning machines, cleaning supplies and equipment services to the Kansas City area for over 30 years. The Close: David and Marsha Phillips needed assistance selling their company to David’s daughter and son-in-law, Kara and John Ryel, who had been working in the business for over 5 years. As with most family transitions, the younger generation did not have the cash resources to purchase the business in a conventional structure. The Ryels were about to partner with an investor in a transaction where they would retain 50% of the equity and the investor would get the other 50%. Seeing this, the family’s financial advisor introduced the family to DVS in the hopes of preserving more equity for the buyers. DVS assisted the family in locating a bank that would finance the transaction without requiring investor capital, and worked diligently with all sides (including the bank) to structure and efficiently close the deal to everyone’s benefit. Despite major changes in tax code and bank requirements during the course of the deal, DVS successfully completed this generational business transfer with minimal financial adjustments for either buyer or seller. The Ryels retained 100% of the business equity, resulting in significant financial benefit and operational simplicity going forward.